Hola todos! It is a new year, and with that, I want to first and foremost say to you all, happy new year!! I know, I know, it’s been a minute since I have uploaded something onto the blog but I promise it hasn’t been because I have forgotten about this platform. I have been doing a lot of thinking and planning for this year and for this blog – indeed another year, another adventure. 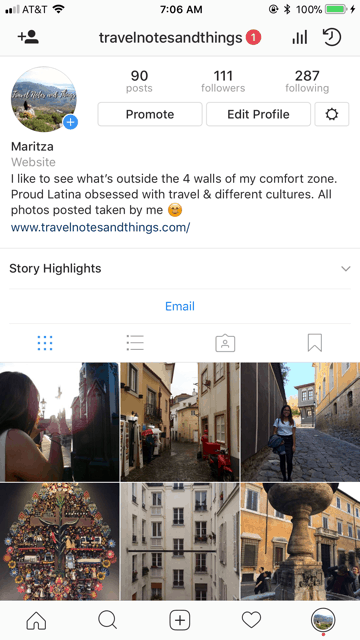 As confusing and indecisive as I can be, If there’s one thing I know for certain is that I want to continue growing Travel Notes and Thing by offering my insight on travel especially as a Latina, listening to other stories about travel from you all, feeding off of each other for travel inspiration, living simply, and so much more. I have also explored other ways to expose my ever increasing wanderlust via different social platforms, including YouTube…so keep reading to see what I mean! For starters, one of the things I want to show you is TNAT’s instagram growth, which if you haven’t checked it out yet here it is! I have been working on growing my other other social media platforms for TNAT, which I love to use frequently to communicate and express more of my love of travel and cultures. We have been slowly and steadily growing, and I am very happy to see the increase, but more than anything, the connection to so many of you who have the same passions as I do has been the biggest reward. As some of you may or may not know, I am part of a YouTube channel with 2 other friends of mine called The Millennial Chisme. Mainly the type of content we present on this channel are reaction videos to new songs and music videos, and most recently, travel videos since I went on a few trips in October of last year. I decided to film them and upload them onto our channel. So without further ado, disfruten! My trip first started in Madrid, as I was visiting my sister who was studying abroad there. I decided to go visit her, while at the same time, revisit one of my favorite cities and friends I had made during my year abroad there. A week wasn’t enough to do it all, but I was very thankful for being there in the first place, seeing my sister, and seeing the people that became my family abroad. Ugh, Alcala de Henares will always be one of my favorite places to visit. It’s so easy to get there, and I wanted to document it, so here it is. The day I went was a day that my sister had class, so I literally had a few hours to myself. Since I only had few days in Madrid, I wanted to make the most out of my time so I was thinking of either going to Alcala de Henares or Aranjuez (also a beautiful place to check out!). I chose Alcala, and quickly realized that I went on a goooood day. As I walked closer to the historic town square, I realized that there was an event taking place. Alcala de Henares was hosting a festival surrounding Miguel De Cervantes that week, and I just so happened to not know lol. It was so cool, and I totally recommend you to go if you are in Madrid the week of October 9th! I love travelling to new places. One of the things that I love about travelling is that it challenges me to get out of my comfort zone, and it allows me to navigate a whole new set of norms, culture, language, and script – these are the reasons why I chose to go to Bulgaria. Toledo is a place with many good memories for me, since living in Madrid, and having the opportunity to visit it on more than one occasion. This time I went with my sister who showed me a different side of this beautiful city, and where I finally found the zip line! It was so much fun to see this different side of Toledo, and I think it deepened my appreciation for many things…you’ll see why lol. Let me know what you all think! I would definitely love some feedback, especially on if you’ve been to any of these places! Also, any technical feedback on vlogging and filming would be great as well as I am literally not a professional with filming travel videos. I had a lot of fun editing and thought it’s been a challenge, I am getting more and more comfortable filming in public so I may continue to document my travels this way in the future. We shall see lol. I hope that the new year has been off to a good start for you all. I also hope that this year brings amazing things and that it brings you closer to your goals and aspirations.